Now a days, the diseases have become our domestic members and pets. This is because of boosting industries, transportation that emit carbon in the air. And when we breath in, then the toxic components get into our body resulting a sever sickness every day. Though, we are getting the health sector modern and digital everyday, but the production of diseases is not stuck on the way. Rather, the disease group is step ahead than remedies in marathon race of our life. Crohn’s disease is one of them. The Crohn’s disease generally hits the last segment our small intestine. Otherwise, it also trends to harm to colon, the large segment of intestine. So, the small intestine and colon are main victims of Crohn’s disease. Crohn’s disease symptoms and signs can range from very light to the severe condition. Though it develops gradually but affect to intestines and colon more severely. Diarrhea: This is a common symptom of crohn’s disease. The severe intestinal pain may cause diarrhea. In this situation, the patient should be under optimal care and take sufficient saline to get rid of dehydration. Fever and fatigue: Due to have the infection or inflammation of intestine, the patient of crohn’s disease symptoms may suffer from mild fever and feel tiredness. It increases dryness and the patient become thirsty. Abdominal pain: The ulceration and inflammation can hamper the normal movement of foodstuff through the main digestive tract resulting a pain and cramping on a sudden. So, the patients affected by Crohn’s disease may feel vomiting and discomfort due to heavy pain. Bleeding in stool: The Crohn’s disease symptoms is a fatal one amongst other diseases. You may have bleeding with your stool. When you create pressure in toilet, you will have noticed it is bleeding if you have ever affected by the disease. Sores on mouth: The mouth ulcer is a definite case when you have affected by Crohn’s disease. It looks like canker sores and very painful. It reduces appetite and loses your standard weight: You will not understand what a painful disease it unless you suffer from the disease once. Abdominal pain, cramping, inflammation and infection also affect the wall of your bowel that may lead you to lose your appetite. Otherwise, it may be a reason to your standard weight loss. It is also responsible to hamper absorbing foods and disturbs the digesting system. As a result, your hunger can take sufficient food you need. 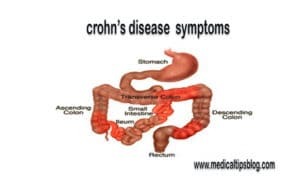 However, except the above detailed symptoms, there are lots of symptoms are seen in case of Crohn’s disease. Inflammation of outer parts of the body such as eyes, joints and skin. Inflammation of the inner parts of the body such as bile ducts and liver. Safe line: disease begets disease. And it will continue till our living time ended forever. So, we have to be very careful in keeping us clean and aware. However, every disease is basically a dangerous one. So, keeping in mind the similar significance to every disease, we better take doctor’s suggestion in time. Therefore, for the crohn’s disease symptoms, we have to take equal care like other fatal diseases to keep us safe all the way.